In the morning we leave Hanoi for Cuc Phuong National Park, which is 130 km south of Hanoi. Upon arrival in the National Park we visit to the Primate Rescue Center, which is dedicated to the rescue rehabilitation, breeding, research and conservation of the endangered primates of Vietnam. From here we drive further to the centre of the national park where we start our real jungle trek through the national park. 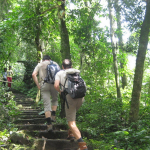 A national park ranger will be bur on – site guide who makes sure that we do not get lost and he will tell us about the flora and fauna of the park, picnic lunch in the shade of a giant tree. After 6 hour trek with lots of descents and ascents on jungle trails we make the last climb downhill to a peaceful valley and reach the village of Khanh, home to Muong ethnic minority. We will have dinner and spend our night with a family in their traditional house on stilt.